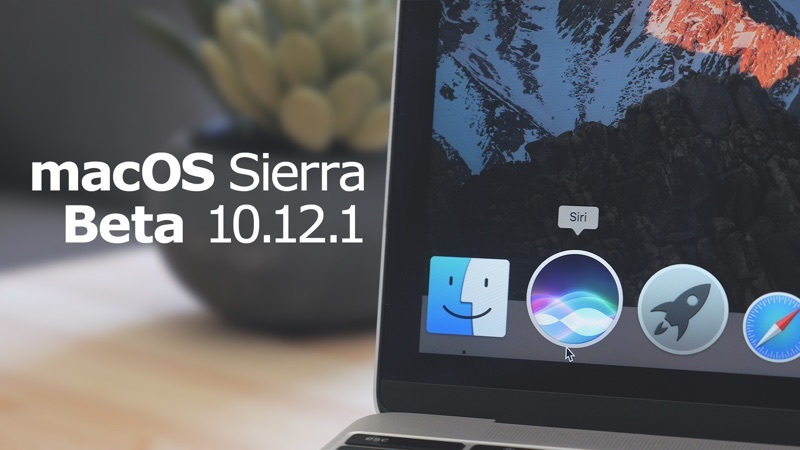 Apple today seeded the fifth beta of an upcoming macOS Sierra update to developers and public beta testers, just over one week after seeding the fourth beta and a month after releasing the new macOS Sierra operating system to the public. macOS Sierra 10.12.1 beta 5 can be downloaded from the Apple Developer Center or through the Software update mechanism in the Mac App Store for those who already have an earlier 10.12.1 beta installed. macOS Sierra 10.12.1 appears to focus on bug fixes and under-the-hood performance improvements to address issues that have been found since the operating system’s release, and it’s also likely adding features designed for next-generation MacBook Pro models set to be released later this year. Few outward-facing changes were discovered in the first four betas, but it 10.12.1 does include Photos support for the new iPhone 7 Plus Portrait feature introduced with iOS 10.1. New features discovered in the fifth 10.12.1 beta will be listed below. macOS Sierra is a significant update that brings features like Siri support, a new storage optimization option, cross device copy paste, auto unlocking with the Apple Watch, and more. For full details on macOS Sierra, make sure to check out our roundup. macOS Sierra 10.12.1 appears to focus on bug fixes and under-the-hood performance improvements to address issues that have been found since the operating system's release, and it's also likely adding features designed for next-generation MacBook Pro models ('https://www.macrumors.com/2016/09/28/late-october-macbook-pro/') set to be released later this year. Don't even give them the option. Change that to next week. For the love of god please fix the issue with external 4K monitors (Dell P2415Q in my case) not turning on when connected to a closed rMBP on a restart and then not allowing the built in screen to turn on when opening it, causing a hard reboot with the screen open. Worked great in all versions of El Capitan.. Absolutely agree. Asus here, same problem. * iTunes before that was way snappier (don't get me started on the stupid hearts-system where one state cannot be accessed in playlists). * Bluetooth automatically disconnects - reconnects - disconnects. ... all of this worked with Mavericks and stopped with Sierra. Thank you, Apple. The list is so long, I have regretted updating my system and I will certainly never ever again update my computer, once the last service update has come along. Sierra has been a disappointment all along. Has Apple forgotten that people actually work with this OS and depend on its reliability. Have they forgotten that this was the reason we chose to invest money? I love Apple. I hate what it has become. I hope they've fixed all the Safari bugs and glitches. Picture doesn't look like invitation; not interested. My ipad is not finding the update. I got Beta 4 the other day but it says up to date now. I even restarted it. Did the ipad not get Beta 5? Yep, after all the posts about the 27th I'm a bit shocked that they'd say 'this year'. Makes me wonder if there's any truth to the 27th or if it's just click bait. Try holding the Shift key (=Safe Boot) while starting up. Thanks - Tried that - no go. Then Pulled out the backup drive cable. Fixed! The progress bar issue during installation has been fixed in this build.